We are excited to be using the Fusion Mineral Paint to do a variety of projects! Fusion Mineral Paint is an innovative product that is easy to apply, self-leveling, and requires minimal prep work. We like how the end projects have a durable matte finish that lasts for a long time. There are 24 custom-blended colours that we can choose from, which are rich in colour, depth, and hue. The paint is perfect for any of our home décor projects small or large, inside or out. We chose three colours, Upper Canada green, Fort York red, and Champness blue to do a few projects that we are excited about. Fusion paint is 100% acrylic, so it can be applied to most previously painted or coated surfaces without priming. Since it has a built in topcoat, all we need is one coat. The paint is non-toxic, lead free, and odorless because it has no volatile organic compounds or ammonia or formaldehyde. All of these features make this paint ideal for our projects. Our first project was transferring this cherry coloured dresser using the Champness blue Fusion Mineral Paint. Although, it is not necessary we sanded the dresser before wiping it clean and applying one coat of the paint. 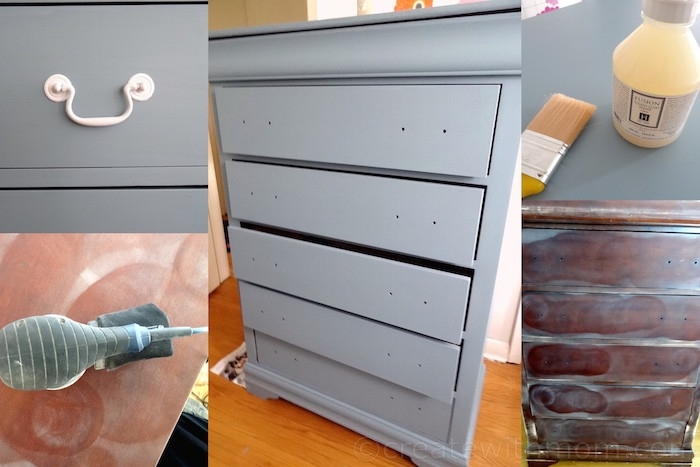 We were surprised that this dresser took less than a quarter pint of paint. We only painted one coat, although two coats are recommended. We did this project inside in a small space and found there was no odour and it dried quickly. The paint didn't leave streaks, and it applied smoothly. Even when we tried painting over the first coat in some areas the paint that dried did not create a layer. We found that after the paint dried it looked professional and stayed well without peeling off even when it was scratched lightly with our nail. Since this dresser gets a lot of high traffic on a regular basis, we decided to apply the Clear Fusion Tough Coat Sealer. We like that the Fusion Tough Coat Sealer is non-yellowing and it did not change the colour or look of the dresser after we applied. It is an invisible layer that does not shine or show, rather it protects the end product. Cleaning up was a breeze, as you see in the video below the paint didn't run off into the sink. 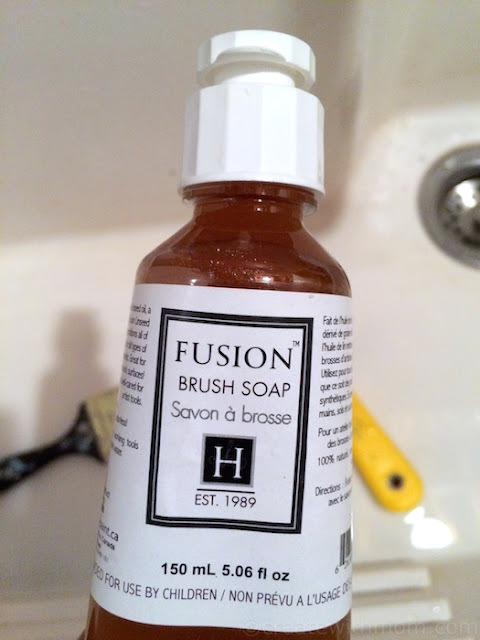 We found the Fusion brush soap to be useful and helped us clean off our brush and hands after painting and applying the tough coat without leaving a strong scent. We are glad that Fusion Mineral paint allows us to do professional looking projects. We love how Fusion paint allows us to do quick projects on any surface with minimal material. Looking forward to share the other projects soon. The Fusion Mineral Paint is made in North America using locally sourced raw materials and is sold at retail stores across North America, United Kingdom, Europe and Australia. Wow dear, you did great job :) perfect dresser DIY! Bailey Dexter Love the before & after! Loves like a great product as the end results look great! 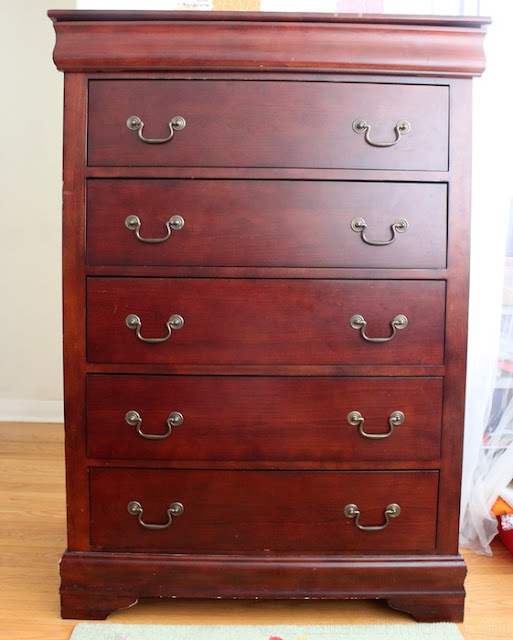 Your dresser looks awesome! I love that there is no odor! WOW! You did a fantastic job! That definitely does not look like a DIY project, its fantastic! Sounds like a fantastic paint to use. Perfect coverage. What did you use on the hardware? I really like this painting project. The color is lovely.